Ward Lavino oversees Northwestern Engineering’s professional master's degree programs. The focus of his work involves identification, marketing, and delivery of professionally relevant engineering curriculum and programming. Prior to joining Northwestern’s McCormick School of Engineering in 2015, Ward worked at the University of Maryland at College Park and in staffing and recruiting in the financial services industry in the Washington, DC region. 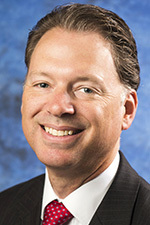 He holds a BA in history and political science from Rollins College, an MBA from Johns Hopkins University, and an Ed.D. from Vanderbilt University.